Listen - I'm sure this can be difficult for you guys because as women we talk ALL the time, lol. But begin listening, watching, and taking cues of things that peak her interest; certain scents, designer brands, favorite colors, etc. As women we are ALWAYS giving hints and clues of what we like and what we would LOVE to have. Trust me on this, I've given so many clues that I've now resorted to sending screenshots, lol. Be selfless - This is where many of you will get into trouble and possibly end up in the doghouse. Be selfless, that means get her a gift that she will love and appreciate, not the one that you'll love. She may not be into tassels and an edible thong, but then again she may. If she is, don't worry, they will be another post dedicated exclusively to lingerie in the weeks to come. Make it personal - Guys, this is not your office pool during the holidays where you can simply run out and get a department store gift card. Whatever you do, please DO NOT gift a stinking gift card. That's so impersonal and really sends the message that you didn't care enough to try. Make your gift selection personal to your unique lady. If she likes journaling and note-taking, get her something specific to that hobby and show her that you take notice of the small things, trust me, we love stuff like that. She has 5 senses, you only have 1 - It's been proven time and time again that men are visual creatures, we get it, but your lady has 5 senses and there's nothing more romantic than stimulating those; sight, hearing, smell, touch, and taste. Think beyond a tangible gift and trigger her senses with tantalizing aromas, delectable delights, sensual touches, etc. Communicate - This is a biggie (at least for me). Once you've gifted your lady with her gift(s), explain your choices to her. Let her know that you took notice of that designer bag that caught her eye. Explain to her that you remembered how she loves to write and you thought a journal set would be a great way for her to jot down her thoughts, etc. Whatever your reasoning, explain it to her. Often times something that would be looked upon as a simple gift can become so much more when we know the meaning and thought process behind it. Now that we have that clear, let's get to gift selections! Below you'll find many options that I consider great options for her. Happy shopping guys, I hope that you'll find some of my suggestions useful in your search of the perfect gift! Good tips for any gift purchasing and I love those red pumps! You were spot on with the keys to selecting a great gift. Let's hope those "visual" men read the tips, too. I'm sharing this so hubby can see that purse!! Aaahh.. I have a few of the Dooney and Burke! My weakness.. :-). These are all lovely gift ideas. I'm now a big V day celebrant though. Every day should be.. :-). Every day should be Valentine's day in my book, that's why l don't celebrate it. I do however, have a few of those Dooney and Burke bags. My weakness :-), and very good gift items. These are great tips for purchasing a gift for any occasion. 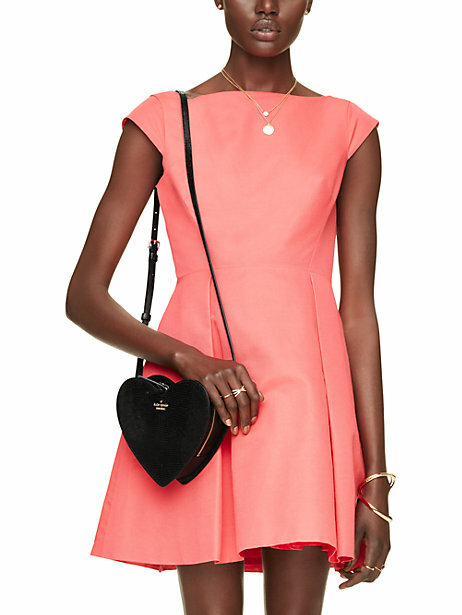 I also totally love the heart shaped Kate Spade bag pictured with the pink dress! It would make the PERFECT accessory for Valentine's Day. I love all of your choices! I'd take anything here, especially the chocolate. My Babe is really good in the gifting arena. He has had many years of practice. We usually do a low key Valentine's Day. This year I told him I wanted hair. hahahaha I'm trying to grow out my haircut and it isn't cute. He can never go wrong with a new handbag. I love they backpack purse. I am really falling in love with purse options that free up my hands and can be worn. Adding this to my Valentines wish list! Great list! I wouldn't mind a handbag this year, and chocolates to go along with it is a must! Great gift guide but even better was the list of considerations before you shop. Very, very thoughtful and useful. Ill gift something to my sweetheart..